NES Abadox (USA) in 15:30.03 by NecroVMX. Abadox is a futuristic sidescrolling shooter developed by Natsume. A gigantic alien organism known as Parasitis has eaten the planet Abadox and everyone on it, including the planet's princess. With time running out, the galactic military sends their best fighter inside the alien to save her before she is digested. 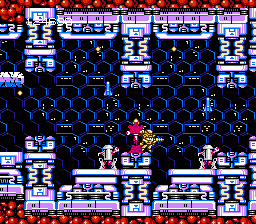 In this run, NecroVMX provides plenty of entertainment during the autoscrolling sections while taking out the level-end bosses surprisingly quickly.